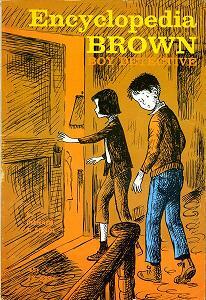 Encyclopedia Brown was the first character I ever felt a kindship to… I was a quiet, bookish girl who spent all of my spare time reading, or helping my school librarian shelve books (with the hopes of finding new books to read!) At the time, there was a section in the library that was off limits to me because I was too young and couldn’t possibly understand the books, but the librarian used to let me “sneak” books from this section as I was shelving. I was pretty much a loner, because in the real world, being bookish just meant that you were a know-it-all. Encyclopedia was bookish AND cool. I mean, he had a best friend that could knock out even the meanest bully and his dad asked him to help solve police crimes! And to top it all off, I could solve most of the crimes that he did! This entry was posted in Books in General by Jamie Forrest. Bookmark the permalink. I can honestly say I’ve never read the EB books (Terrible, I know! ), but I totally feel you on the bookish loner thing. My first-grade teacher allowed me to check out chapter books in the first semester of school while all the other kids had to check out picture books. They looked at me as if I had three heads! I definitely remember Encyclopedia Brown!